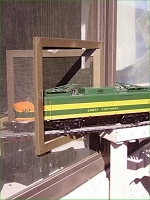 People have been taking their Lionel trains outside on sunny days since the early days of toy trains. Of course the trains, the track, and even the buildings were rust-prone, so they took everything back in when the dew started to fall. But a few brave souls built track and buildings that wouldn't rust out and created permanent O-gauge garden railways throughout the 1900s. (They still took their trains in when they were done, as "O-Gauge Outsiders" do today.) But O Gauge Outside never caught on as a widespread hobby. 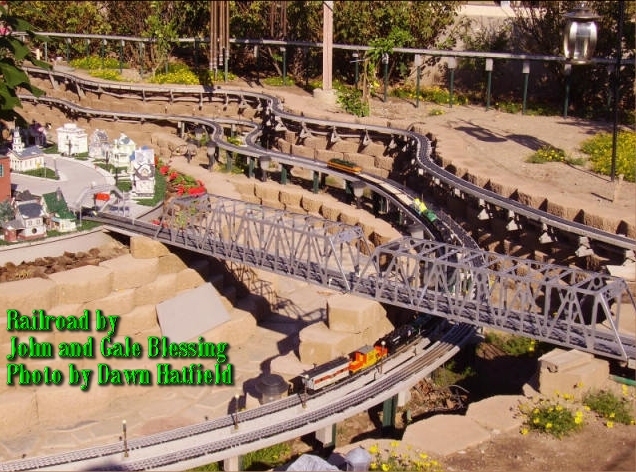 When LGB trains reinvigorated the Garden Railroading hobby, folks with a basement full of O-gauge trains wondered if they could build a garden railroad using trains they already owned. 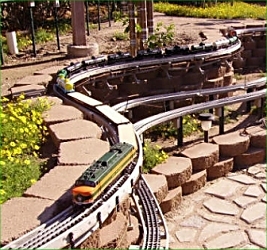 In fact, ever since we started Family Garden Trains™, we've been asked that same question in one form or another. And fortunately, the answers to the same old questions keep getting better, as new products and technologies become available. Though I've been collecting information for an article like this for years, I didn't feel I could make it credible without showing some great photos of a successful O-Gauge Outside railroad. In March, 2007, I got my wish. A Tucson family, the Blessings, sent me a link to a "photo album" of their railroad, and John was helpful with my questions. 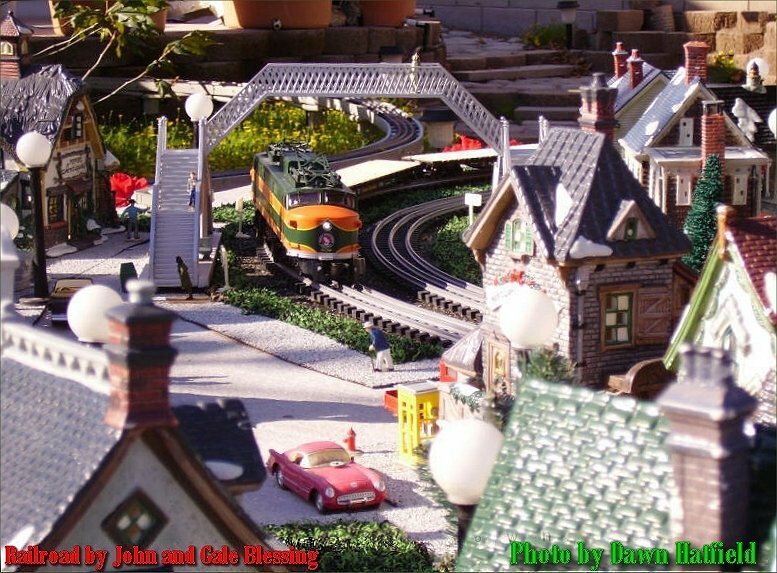 So the O Gauge Outside articles are a summary of what we've learned so far, with much input and applicable photos from John Blessing and his family. Also, although I refer to Lionel frequently, 99% of these articles' content also applies to using other brands such as MTH, Williams, or K-Line. In fact, there's no compelling reason you couldn't use American Flyer S gauge trains the same way, although the track options aren't as good. 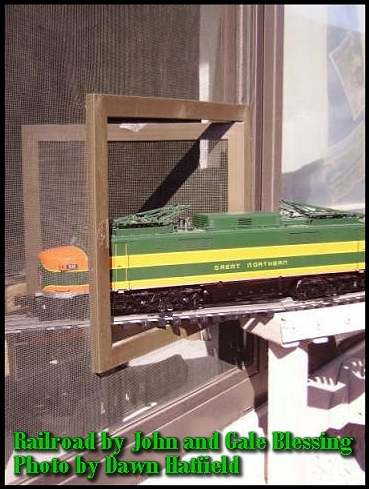 If you want to try running American Flyer S gauge trains outside, contact us, and we'll send you the information we have. Although most buildings designed to go on garden railroads are made to withstand serious abuse, they seldom encounter any abuse worse than direct sunlight, rain, and bird droppings. As long as you take steps to protect your buildings from UV, weigh them down, and avoid putting them under walnut trees, you'll probably be OK. Planning an O Gauge Outside Railroad contains more information on this subject, too. 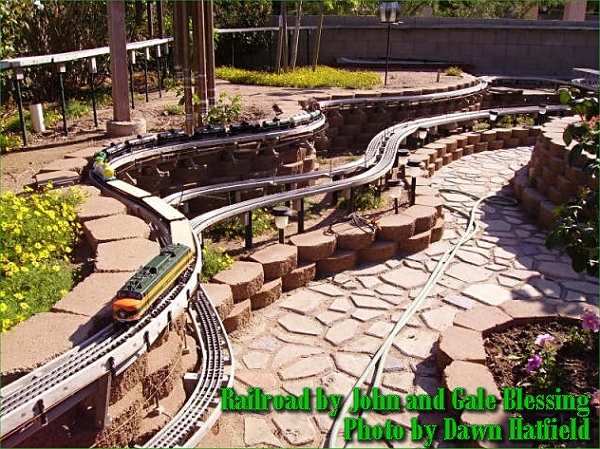 Unlike Large Scale trains, which are made for garden railroads, O gauge trains are not rust-resistant or UV resistant, and some are particularly vulnerable to sand in their gears. 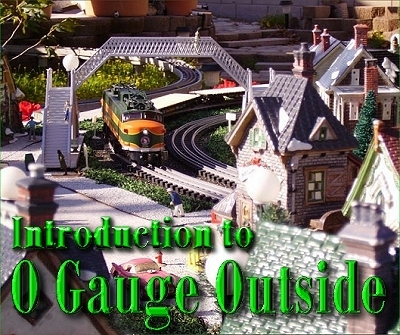 The most successful O-Gauge-Outsiders are folks who've figured a way to get their trains in and out quickly, so they can run on pretty days and run for cover in inclement weather without too much hassle either way. To the right you can see a "pet door" that the Blessings use to run their train in and out of their "train room" quickly. Note about O Gauge versus O Scale - By the way, I say O gauge when referring to the trains because not all trains that run on O gauge track (1.25" between the rails) are the same scale. 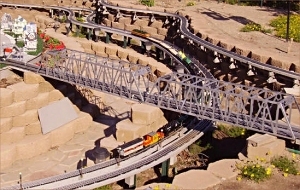 O scale refers to a particular proportion (1:48) between a model and the "real thing." For example, an O scale building should be 1/48th the size of the real building. But most trains that run on O gauge track are actually a little smaller than O scale, especially in length. Fortunately, they are still plenty big enough to be effective outdoors if you plan properly. Trains in 1:48 and even 1:45 are available, and they look even better outside. But that's not what most O-gaugers are interested in running outside. For the sake of simplifying the terminology in this article, I will say "O scale accessories" and "O gauge trains." Please contact me for more information if this "explanation" has muddied the waters. One big difference is that O gauge track is not quite as sturdy as LGB or AristoCraft Large Scale track, so we recommend using a method that provides a sturdy base that supports the whole length of the track. This rules out some "floating" methods that garden railroaders often use, in which track is simply laid on packed gravel and more fine gravel is poured between the ties to represent "ballast." But track laid on poured concrete "roadbed," on pressure-treated lumber, or on HDPE roadbed is just fine. And all of those methods are lower-maintenance in general than "floating track" so there's no huge problem.